High school teachers got a crash course in collider physics at Fermilab last weekend, during the first European Masterclass as part of the QuarkNet program. A group of high school teachers from five states and Puerto Rico participated in the first European Masterclass at Fermilab last weekend. Coordinated with the European Particle Physics Outreach Group, the class was offered as part of the QuarkNet program at Fermilab. QuarkNet is an educational program funded by NSF and the DOE Office of Science designed to support science education in high schools by establishing a nationwide teacher network. The goal of the program is to introduce teachers and students to modern research in the field of particle physics under the mentorship of an active scientist. The first training of QuarkNet teachers took place in summer 1999, featuring a workshop that introduced 24 teachers to particle physics. The new masterclass, developed with particle physicists in Europe, orients teachers and students toward the upcoming experiments at the Large Hadron Collider at CERN. 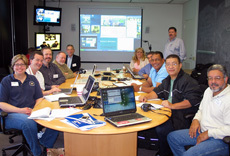 "In a sense, it is like a violin master class, in which violinists all work with an expert to learn something," said Hector Mendez, a CMS physicist from the University of Puerto Rico at Mayaguez who arranged the class with the help of Ken Cecire, a member of the QuarkNet staff. The masterclasses around the world give students and teachers access to data created by the now dismantled Large Electron-Positron collider. Cecire said it also provides a great network for teachers. "It helps them figure out what kind of pedagogy works," he said. Dan Karmgard, a professor at Notre Dame and also a CMS member, gave a talk on Sunday morning that helped the group prepare to analyze physics data. The group then spent Sunday afternoon analyzing and interpreting signals in collider physics data. On Monday morning, the teachers compared their results via videoconference with other teachers from concurrent masterclasses in Germany, Italy, Slovakia and the Czech Republic. Gilberto Sanchez and Luis Torres-Rosa traveled from Puerto Rico to attend the conference. For Sanchez, the conference marked his first visit to Fermilab. "I've only seen pictures before," he said, "but here, the science is alive." Mendez was impressed that the small group of teachers "reaches more than 1000 high school students who will benefit from their teachers' knowledge of particle physics in the classroom." Torres-Rosa added that although the analysis they completed was difficult, it opened his eyes to the learning potential of physics data: "Physics particles have completely changed my mind, in a good way." Universities Research Association Inc. (URA) will reward outstanding work conducted by a postdoctoral researcher at Fermilab or in collaboration with Fermilab scientists. Alvin Tollestrup will present the award during the 2007 Annual Users' Meeting. All Ph.D. researchers in non-permanent positions at Fermilab or URA member institutions who are within six years of the receipt of their Ph.D. as of the nomination deadline are eligible. Candidates should nominate themselves for the Tollestrup Award. The award is for a particular research project conducted during the nominee's postdoctoral years, demonstrating the nominee's own scientific insight and creativity. A committee appointed by the Fermilab Director, Pier Oddone, will make the selection of the most outstanding work. The recipient will be notified by May 31, 2007. All nomination material should submitted via e-mail by Monday, April 30, 2007. The GridPP project is building a computing Grid to analyse data from the Large Hadron Collider (LHC), a new particle accelerator near Geneva, which will be turned on later this year. The funding announced this week will allow GridPP to continue into its third phase, running until 2011, covering the period when the LHC starts taking data. Professor Keith Mason, CEO of PPARC said "The Large Hadron Collider at CERN is the world's largest physics experiment, recreating conditions last seen just after the Big Bang in order to better understand our Universe. The detectors will register a deluge of data at up to 15 Gigabytes per second - or 3 DVDs every second. To store and manage this data requires a new approach - the Grid." When scientists take their detector prototypes to a test beam they enter a parallel world. Many basic needs are put on hold - the need for sunlight, regular meals or eight hours of sleep, for example. What counts is the beam time: you have three days, weeks or months to test your equipment, and you have to make the best of it because you might not get another chance. A team from Japan and Korea have just reached the halfway point of their time in the DESY test beam, calibrating, checking and recording data with their electromagnetic calorimeter prototype. The team from Asia brought three different components with them that they are testing consecutively in all possible configurations. To record and read out their data they use the readout system built in Europe for the hadronic calorimeter - proof of a working CALICE collaboration. "It's a very good beam, the electronics work very well, we're meeting old friends and we've got plenty of time - ideal conditions," says Tohru Takeshita from Shinshu University. While the analysis of the results will only start properly when the team of ten scientists returns to their institutes in Japan and Korea, taking peeks at the screens in the control room they think it's looking pretty good so far. Over the last few months I have taken a keen interest in the falcon that has been hanging out on the east side of Wilson Hall. I guess they have been watching me too, because this morning the falcon introduced itself as it sat on ledge outside my office. I took this picture as the falcon sat and watched me drink my joe this morning. 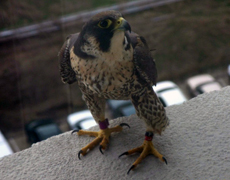 We were able to identify this bird from the Midwest Peregrine Society's database by using the colors of the bands on her left leg. This peregrine falcon is a one-year-old female called Neomi Jo. She hatched on March 16, 2006 in Bedford, Trimble County, KY. Her parents nested on a smokestack at the Louisville Gas and Electric Company plant. She was banded one month after hatching and started flying a week later. I hope we can get more information about her mate. Fermilab will experience a utility outage in drinking water over the next few days. The process of sectionalizing the domestic water system to locate leaks began yesterday and will last through Monday, April 2. Areas may experience a short-term loss of domestic water. Only the main site domestic water system will be affected. Questions and concerns should be directed to Steve Shirley at X3007 or Greg Gilbert at X6835. The on-site Employee Assistance Program office will be closed on Friday, March 30. As always, EAP is available 24 hours a day, seven days a week by calling 1-800-843-1327 or by visiting the EAP website. Find more information here. Kyuki-Do combines the strikes of Taekwon-Do, the throwing and grappling techniques of Judo and Jujitsu, the joint locks of Hapki-Do, and the practice of Kobudo (traditional weapons) into one art. Classes are held on Monday and Wednesday from 5 - 6 p.m. at the Recreation Facility in the Village. Teacher Bruce Worthel will focus on a practical self-defense that can be used by women or men. You will learn kicks, blocks, hand techniques, throws, pins, self-defense, and forms that will teach you balance, power, and grace. Register through the Recreation Office; classes cost $45 per 6-week session. You must be a member of the recreation facility to join. English country dancing will meet at 2 p.m. this Sunday, April 1, at Kuhn Barn. Newcomers are most welcome and you don't need to come with a partner. The group will continue meeting the first Sunday afternoon of the month in May and then change to a different schedule for the summer. For more information please contact folkdance@fnal.gov or call 630-584-0825 or 630-840-8194.